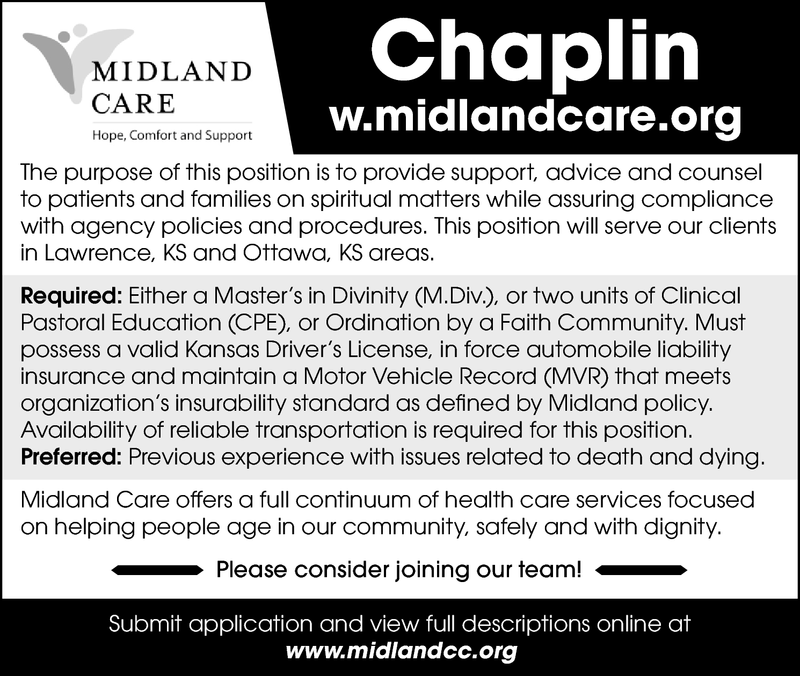 The purpose of the Chaplain position is to provide support, advice and counsel to patients and families on spiritual matters while assuring compliance with agency policies and procedures. This position will serve our clients in Lawrence, KS and Ottawa, KS areas. Either a Master’s in Divinity (M.Div. ), or two units of Clinical Pastoral Education (CPE), or Ordination by a Faith Community. Maintain a Motor Vehicle Record (MVR) that meets organization’s insurability standard as defined by Midland policy. Availability of reliable transportation is required for this position. Preferred: Previous experience with issues related to death and dying. Midland Care offers a full continuum of health care services focused on helping people age in our community, safely and with dignity.